One word game that I really love to play is Scrabble. It's always a challenge, and most of all it's fun. That's precisely why I recommend it for improving English because games are relaxing, the opposite of work, but through competition you can improve your vocabulary. Besides the challenge of scoring high points, creating words, and beating your opponent, you have the opportunity to improve spelling. In addition to forming whole words, one strategy is to look at elements (parts) of words and add additional letters or prefixes and suffixes to create new words, for example, round to around; mix to mixing, mixed, mixes, turn to return. 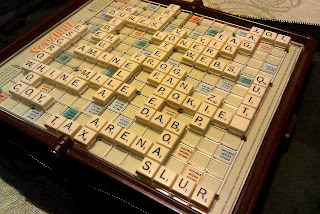 Scrabble encourages players to talk about words, grow vocabulary, define, and spell. I have three Scrabble games constantly in play every day on my smart phone. I value the opportunity to increase my vocabulary and relax at the same time.